LUX* South Ari Atoll, last week, hosted a workshop under the name ‘microplastics, a macro disaster: a threat to the largest fish in our seas?'. The one-day workshop was led by a team of scientists consisting of Giulia Donati from the Swiss Federal Institute of Technology (ETH Zurich) and Alina Wieczorek from National University of Ireland Galway. Maldives Whale Shark Research Programme (MWSRP) collaborated with LUX* South Ari Atoll to host the workshop. 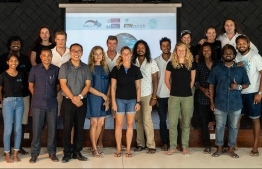 Several marine biologists and resort managers, dive centres and guest houses attended the workshop in order to increase their awareness concerning the threats of microplastic to whale sharks and exchange knowledge on marine pollution within the region. Microplastics are defined as plastic particles measuring less than five millimetres and have become globally recognized as a pollutant of increasing concern. Recent studies demonstrate that high levels of microplastics accumulate in the Indian Ocean. It is probable that endangered whale sharks in South Ari Atoll are exposed to microplastics while they thermoregulate in shallow waters or feed on plankton, most of which are known to ingest microplastics. According to LUX* South Ari, it is important to evaluate threat levels to whale sharks as it has already been proven that microplastics can negatively impact the health of other fish species. The group of scientists identified a non-invasive method of investigating microplastic ingestion in whale sharks by analysing their faeces. The analysis of eight faecal samples collaboratively collected with the Maldives Whale Shark Research Programme since 2015 prove that whale sharks in the region are ingesting microplastic. LUX* South Ari described the project as a unique opportunity to conduct research on whale sharks, which are regarded as an ‘umbrella’ species in marine conservation. According to the resort, understanding the manner microplastics affect the largest fish in the sea, can help efforts to raise awareness regarding the impacts of litter in our oceans.